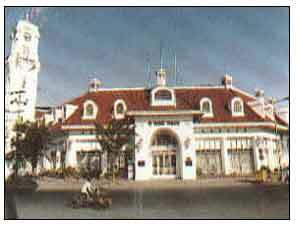 This building was belonged by the Lindeteves Dutch Trade Company located at Pahlawan street (North Surabaya). When Japan goverment this building was used by Kitahama Butai as a mechanic shop to repair and keep the heavy guns and tanks. This building was famous with Glinding Tipis building. On 1945 war, the Indonesian troops could take over this building and it means get also the light guns, pansers and tanks.